Its the New Year, I've been trying to keep to my resolution of exercising more & losing weight. Actually, I kinda mentioned that I wanted to exercise more & lose weight to my gym buddy, L. He took my word for it and hauled my lazy posterior to the gym after I also confessed to not having worked out at all for about 2 months or so. Sheesh! for a couch potato like me, it was sheer torture having to toil on the treadmill @ Speed 5.5 for 20 minutes...L says its a pathetic speed as I barely perspired and was more engrossed in what was happening on TV. Considering how bad my stamina is and how I hardly exercise, I thought I was doing pretty ok till another gal climbed onto the machine next to mine & started running at Speed 10...wow! that's really fast. After the "torture session", I was looking forward to supper. Unfortunately, it was raining cats & dogs so it was too much of a hassle to go to my favourite supper location, C Nai Hong Kong Café. We wound up in McCafé instead. 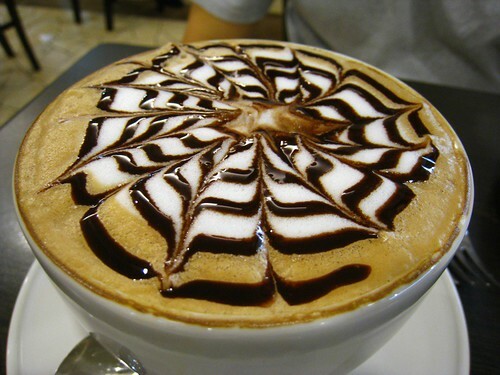 Here's a picture of the Large Cappuccino that L ordered. I was so impressed with the foam art that I had to snap a picture of it. 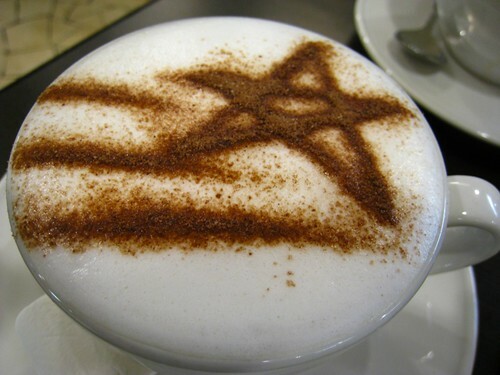 I ordered a cup of Steamed Milk and was also rather impressed with the foam art (done with cocoa powder) on my drink. 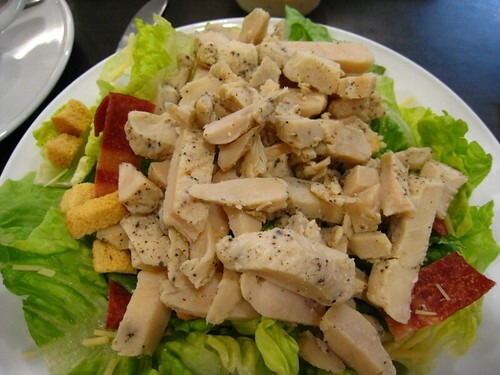 I ordered a Caesar Salad with additional topping of roast chicken. Thankfully, they served the dressing separately without us having to ask. I dipped a few pieces of lettuce into the dressing and found that the flavour of the dressing was not to my liking (tasted like lousy bottled caesar salad dressing) so I ate the salad sans dressing. I also picked out all the artificial bacon strips as I prefer fresh lardons instead. The chicken bits were a little too salty but were fine when taken with the vegetables. I think I should try their sandwiches instead next time I visit.